The Virgin Islands National Park encompasses over half of the Island of St. John, part of the U.S. territory of the Virgin Islands and is significant for its unique marine life, vegetation and dynamic Afro-Caribbean history. While an immediate crisis prompted this "island paradise" to be classified a national disaster zone in September, 1989, the dramatic impact of Hurricane Hugo only accentuated many long term resource conflicts into problems that could no longer be ignored. The separation of ecological protection efforts with human resource use have been underlying issues long afflicting this diverse ecosystem. As participants in a Natural Resource Management field course, 27 university students researched and wrote management plans in order to address many of the problems that have chronically plagued this part of the Caribbean, protect island resilience, preserve sensitive resources, and diminish the crippling effect of an occurrence such as Hugo. The lack of potable water, inadequate waste disposal, development pressures on ecologically sensitive areas, diminishing local trade and a shortage of affordable housing are some of the issues explored in this document. This work focusses on the interaction between the ecological, cultural, economic and political factors of resource use. Results identify key players, resources, activities and possible avenues towards an innovative approach, integrating resource and community issues. 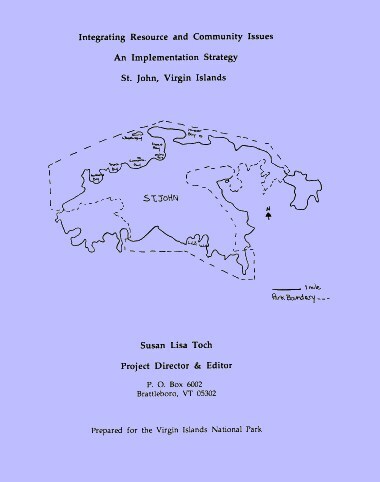 In coordination with the National Park Service, and consultation with state and local officials, community groups and island residents, this project builds on a renewed momentum to assess and strengthen the natural and cultural resources so vital to the community of St. John, and serve as a model for a unified effort in effective resources management. Balancing the quality of our environment with the quality of our health and well-being.